Scientists have captured the first detailed microscopy images of ultra-small bacteria believed to be about as small as life can get. 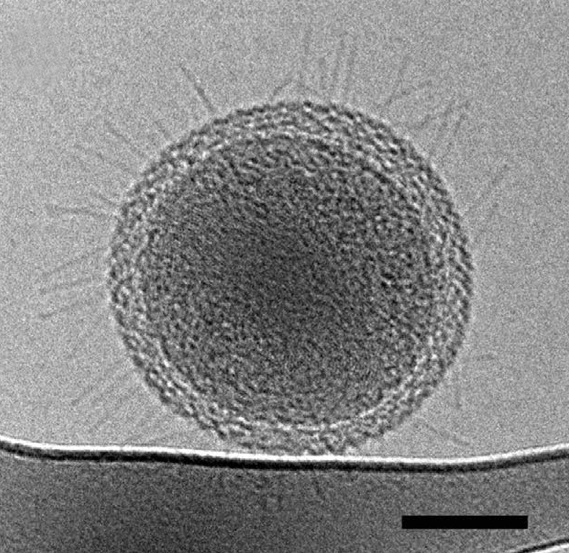 The existence of ultra-small bacteria (aka “nanobacteria” or “nannobacteria”) has been debated for two decades, but there hasn’t been a comprehensive electron microscopy and DNA-based description of the microbes until now. They are about 200 nanometers (.2 micrometers) in width with a volume of only about 0.009 cubic nanomicrons (millionth of a meter). About 150 of these bacteria could fit inside an Escherichia coli bacteria cell. The diverse bacteria were found in groundwater and are thought to be quite common. This is the smallest a cell can be and still accommodate enough material to sustain life, the researchers say. The bacterial cells have densely packed spirals that are probably DNA, a very small number of ribosomes, hair-like appendages, and a stripped-down metabolism that likely requires them to rely on other bacteria for many of life’s necessities. To concentrate these cells in a sample, they filtered groundwater collected at Rifle, Colorado through successively smaller filters, down to 0.2 microns, which is the size used to sterilize water. The frozen samples were transported to Berkeley Lab, where Birgit Luef (a former postdoctoral researcher in Banfield’s group who is now at the Norwegian University of Science and Technology) characterized the cells’ size and internal structure using 2D and 3D cryogenic transmission electron microscopy. The images revealed dividing cells, indicating the bacteria were healthy and not starved to an abnormally small size. The bacteria’s genomes were sequenced at the Joint Genome Institute, a DOE Office of Science User Facility located in Walnut Creek, California. The genomes were about one million base pairs in length. Among their findings: Some of the bacteria have thread-like appendages, called pili, which could serve as “life support” connections to other microbes, and the bacteria lack many basic functions, so they likely rely on a community of microbes for critical resources. The research, led by scientists from the U.S. Department of Energy’s Lawrence Berkeley National Laboratory and the University of California, Berkeley, was reported Friday, Feb. 27, in the journal Nature Communications. Bacteria from phyla lacking cultivated representatives are widespread in natural systems and some have very small genomes. Here we test the hypothesis that these cells are small and thus might be enriched by filtration for coupled genomic and ultrastructural characterization. Metagenomic analysis of groundwater that passed through a ~0.2-μm filter reveals a wide diversity of bacteria from the WWE3, OP11 and OD1 candidate phyla. 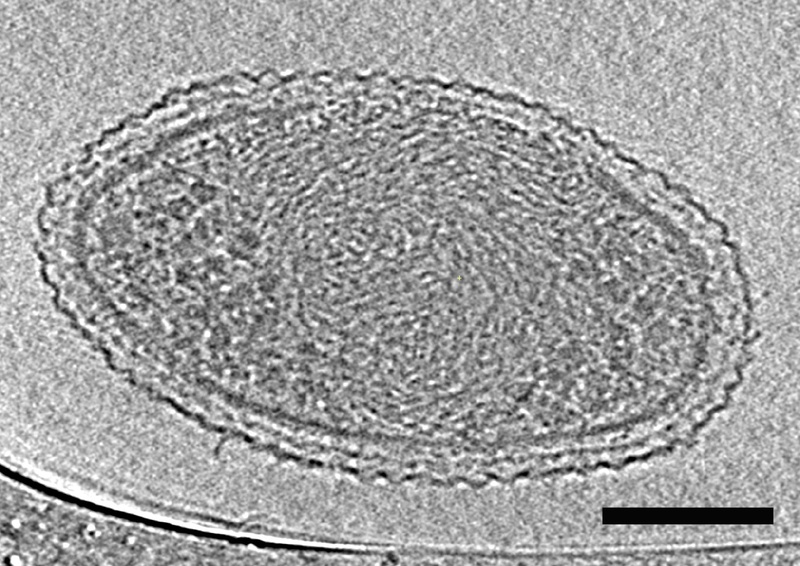 Cryogenic transmission electron microscopy demonstrates that, despite morphological variation, cells consistently have small cell size (0.009±0.002 μm3). Ultrastructural features potentially related to cell and genome size minimization include tightly packed spirals inferred to be DNA, few densely packed ribosomes and a variety of pili-like structures that might enable inter-organism interactions that compensate for biosynthetic capacities inferred to be missing from genomic data. The results suggest that extremely small cell size is associated with these relatively common, yet little known organisms.